Women's Silver Designer Necklace : LOVE2HAVE in the UK! 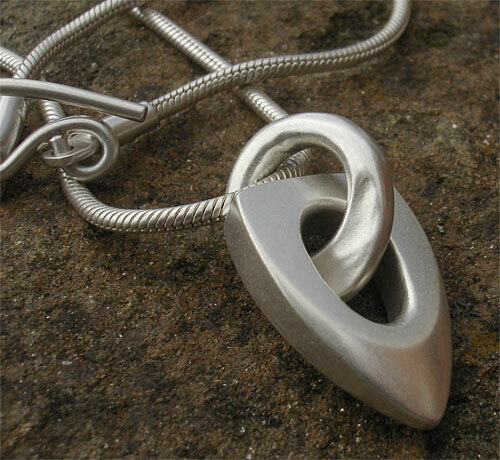 A women's silver designer necklace. This piece of women's jewellery is the snake chain version of the silver designer necklace on suede in the men's necklaces section. It features the same large elongated logo pendant in a matte finish handmade from solid sterling silver. The pendant with its ring loop measures approximately 30mm high. 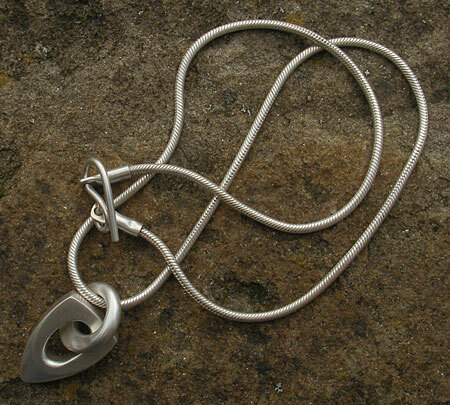 It is quite a chunky piece and features a very attractive and stylised hole upon which the silver ring loop is threaded. This loop has a contemporary tapered shaping to it and comes threaded onto the necklace. The snake chain comes as standard in 16 inches but other lengths are available on request. It has a secure wire eyelet type fastening.